Find yourself searching for the perfect playground? No worries, I was scouting Berlin looking for the best destinations to have fun with children. 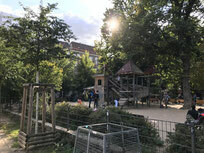 From playgrounds, farms for children to the Teddy's concert at Deutsche Staatsoper Berlin or the flashlight tour for children at Museum für Naturkunde; I found so many awesome spots that I decided to publish a new map PlayBerlin for parents and children soon. I hope you enjoy the selection! For now here is the Top 5 of playgrounds in Berlin, but stay tune. On the weekends, this is probably Berlins most crowded playground because of the nearby cafes and flea market. But that’s also what makes it great. There is also a water plansche here. A huge amazing green dragon is living here between the blocks in Friedrichshain. You can climb through its tail into the head. There is a also a small water fountain here. 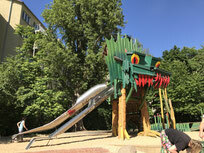 Berlin has a few too many ‚fairy tale’ playgrounds - that’s why we especially like this one with a firefighters theme. There is a big fire truck and wooden houses to play in. The park next to the playground is also very beautiful. In the middle of Hasenheide you can find this amazing playground themed in 1001 nights style. One of the highlights is a big wooden ship. Hasenheide several other playgrounds and a tiny (but free) zoo. Here you can look at differently themed gardens from around the world. But the real highlight is the cable car and the amazing Whale Water Playground. Inside of the whale you can find her heart and also her baby. A big thanks goes to Jannes from www.berlin-playgrounds.de by helping me to find all this beautiful playgrounds with his daughter and taking these pictures!